A painting’s composition determines where one’s eye travels over the painting to create interest and bring the eye back to the element(s) the artist wants to emphasize. 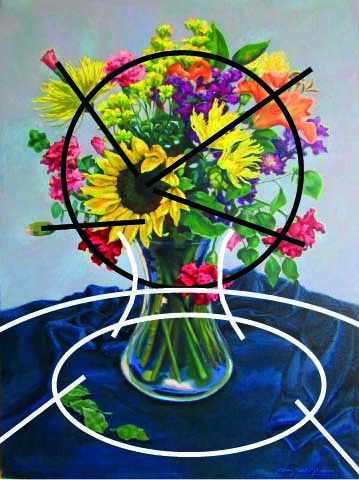 In addition to the value of visual beauty the painting points to objects and communicates “look at this!” In the piece above the lines jetting outward would lead the eye off the painting unless there was a stronger circular line that keeps drawing the eye back in. Notice how this is emphasized in the black and white composition marks. Like the chalk mark plays a football coach makes on the television field to explain to the sports fan how the play was made, these lines lay out the compositional play of the piece. When planning a painting, an artist wants to continually draw the viewer back to the area of interest and to keep the eye moving, enjoying the various details of the piece. In the compositions of our lives, to where do our words and actions point? The best thing we can do for the lives of others is to live in such a way that our lives point to the Savior, Jesus, in whom we find our purpose, joy and meaning.